Our leaders in the House of Representatives courageously passed the Stupak Amendment in their version of the health care bill, but the Nelson-Hatch-Casey Amendment did not prevail in the Senate’s version of the legislation. Of course, that was a great disappointment to us. We still hope and pray that some accommodation can be reached so that abortions will not receive taxpayer funding and there will be adequate conscience protection. This is of paramount importance to the Church. I ask you all to pray very hard and continue to contact your senators. In spite of a minor illness last week, I was able to maintain a busy schedule. On Friday, I visited with Cistercian Abbot Matthew Nguyen Ba Linh from the Abbey of Our Lady of Divine Grace in Vung Tau City, Vietnam. 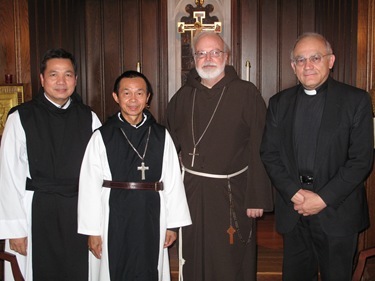 We have two Cistercian seminarians from Vietnam who are studying at Blessed John XXIII National Seminary in Weston. Their superior came to visit them. 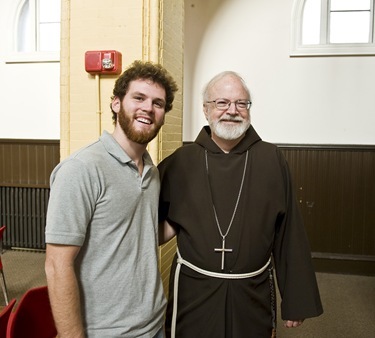 He is visiting the United States in an effort to raise funds to build an abbey in Vietnam. He showed me these photos of the church there, the monks at prayer and also a plan of the extension they are hoping to be able to build to accommodate their many vocations. 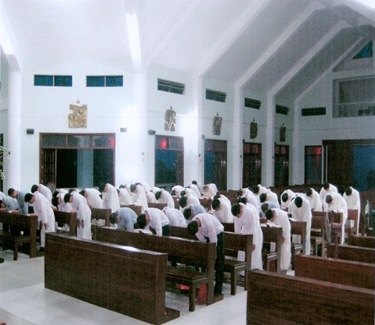 It’s encouraging to see that the contemplative life is flourishing, even in a Communist country like Vietnam. 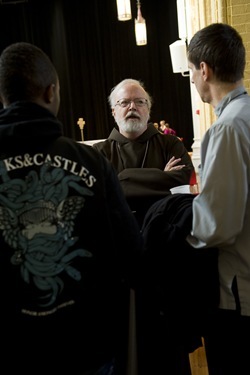 We know that there are many vocations there, and we are happy to be educating some of their men. I was very impressed by the size and the youthfulness of the community. 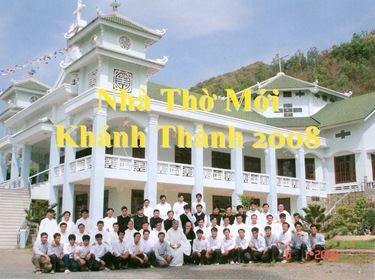 We certainly are anxious to encourage them in their endeavors to establish full monastic life in Vietnam. That evening, I was the main speaker at the fifth and final event of the God of This City Tour that was held at the Cathedral. 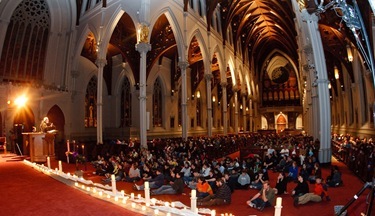 The tour was a five-night event held in various parishes in each region of our archdiocese. 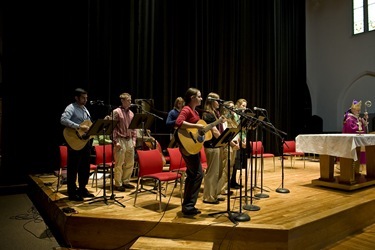 Each evening offered our young people the opportunity to receive the Sacrament of Confession, take part in Eucharistic Adoration, and praise God through prayer and contemporary worship music. The tour was organized by LIFT Ministries, who did a phenomenal job with it. There were 500 or 600 young people there for the final night. 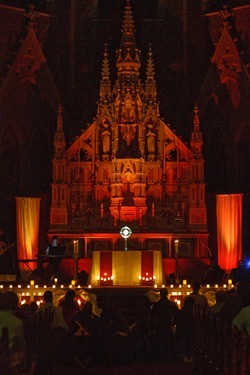 It was an evening of song, reflection, and adoration with an Advent theme. There was great enthusiasm. I addressed them for about an hour and spoke about St. John the Baptist and being a witness in the Church. 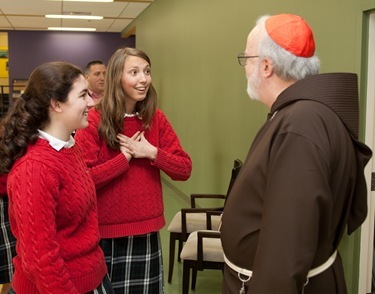 It was a wonderfully successful program at all the parishes they visited over the course of the week. Unfortunately on Saturday, due to a cold, I was confined to quarters. 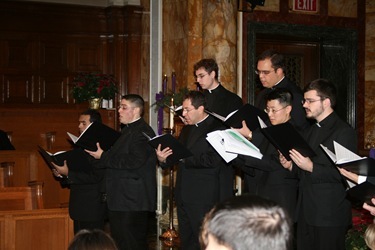 We had some important events that day that Bishop Hennessey stood in for me, including the Women Affirming Life Mass and breakfast, the 50th anniversary of Incarnation Parish in Melrose, and St. John’s Seminary’s 125th anniversary gala celebration, which featured Christmas lessons and carols and a special recognition of Archbishop Al Hughes, a former rector there. 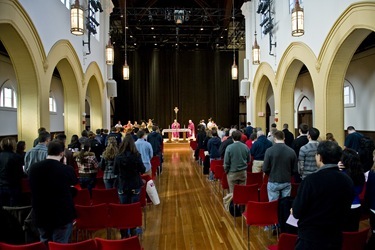 On Sunday, I celebrated a Mass at Northeastern University. The president, Dr. Joseph Aoun, was represented by the CFO of Northeastern, Jack McCarthy, who is on our finance council. 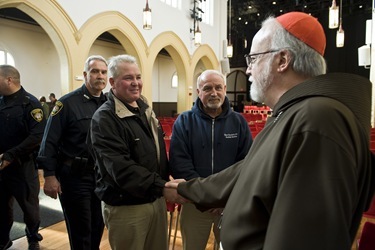 Members of the Brotherhood of Hope, including Father Phillip Merdinger, were there. 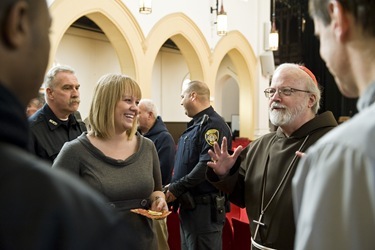 Following the Mass, there was a reception and I had a chance to take a tour of the Catholic Center. 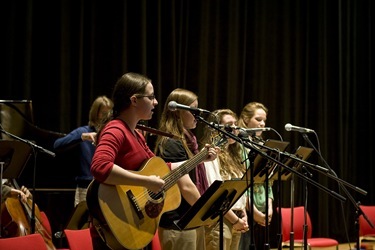 There are many music majors from neighboring universities who are part of the music program. It was absolutely stunning. 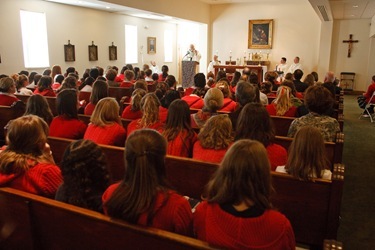 The Mass was very well attended. 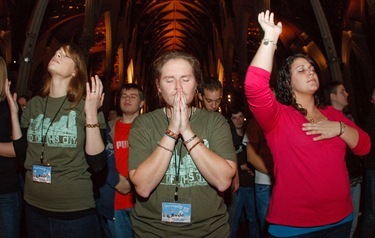 They have a very vibrant student ministry there. 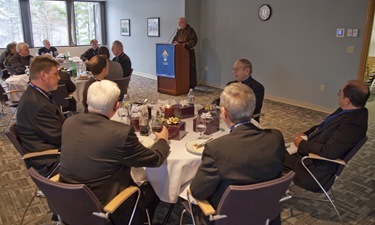 On Monday I had the opportunity to greet the pastors who reached their goal in this year’s Annual Catholic Appeal at the Pastoral Center. For us, the Annual Appeal is the lifeline for our central administration, ministries, and works of mercy. 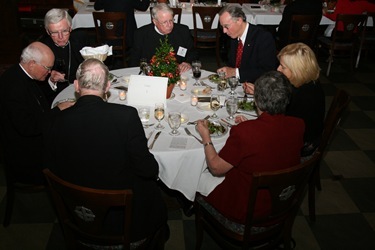 This was a recognition of the pastors who have gone beyond goal to show our gratitude for their outstanding efforts on the part of this very crucial endeavor for the archdiocese. Tuesday was the Feast of the Immaculate Conception. 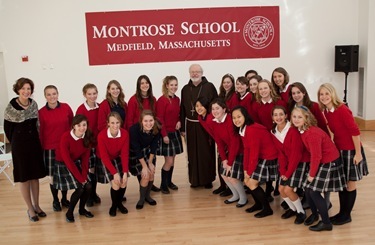 I went to the Montrose School in Medfield. 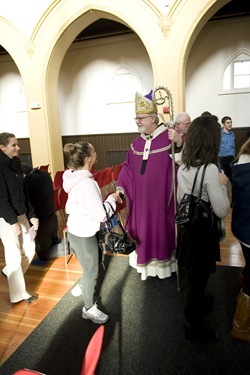 They moved there recently, after being located at St. Patrick’s in Natick for many years. 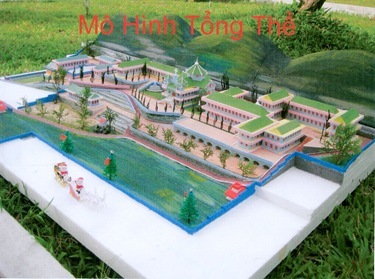 They have built a new school by taking over an old women’s hat factory. They have a bright, lovely facility with a very nice chapel. It is an all-girls school. Many of the girls’ parents and grandparents attended. 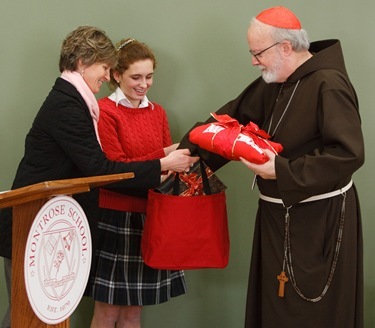 The head of school, Dr. Karen Bohlin, is a numerary of Opus Dei. 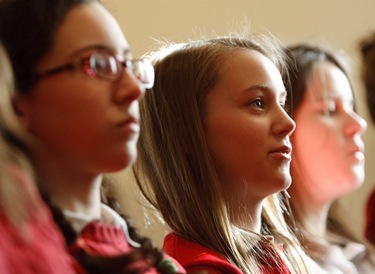 Many people from Opus Dei are involved in this private, Catholic school. It is not exclusively for Opus Dei members, but they’re the ones who have been the motor force in establishing the school. In the chapel, a portrait of St. Josemaria Escriva, their founder, is displayed. They have an extraordinary choir. They did a number of beautiful Latin motifs. Then they did some songs afterwards as part of the reception. 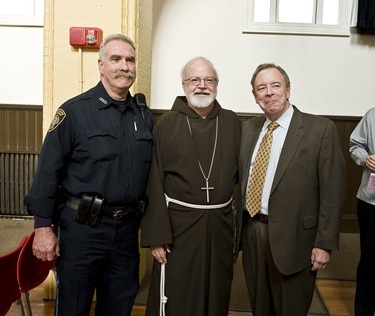 Steve Perla and Father Joseph Corpora, CSC, and Bruce Kaneb from ACE Consulting. This is part of The University of Notre Dame’s Alliance for Catholic Education program for recruiting Hispanics for Catholic schools. They wanted to speak to me about the program. 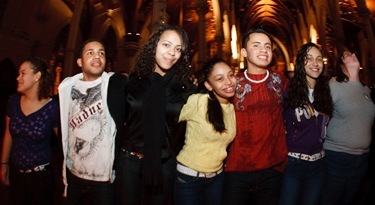 We did have a campaign within the last few months here in Boston where 60 Hispanic students were recruited for our Catholic schools. Notre Dame is trying to promote this nationwide. 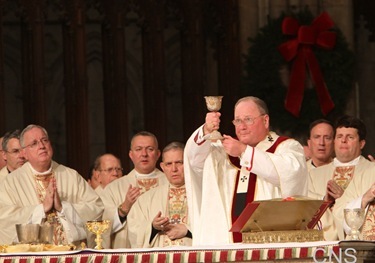 On Wednesday, it had been my hope to attend the Mass at St. Patrick’s Cathedral that Archbishop Dolan was celebrating to mark the 30th anniversary memorial for Archbishop Fulton Sheen. Unfortunately, I wasn’t feeling well enough to make the trip. 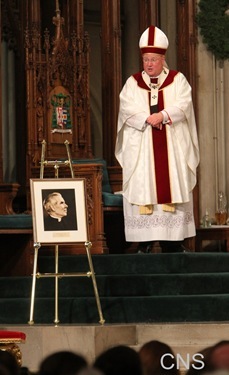 Archbishop Sheen’s cause for canonization has been introduced. It was my privilege to have served Mass for him many times when I was a child. 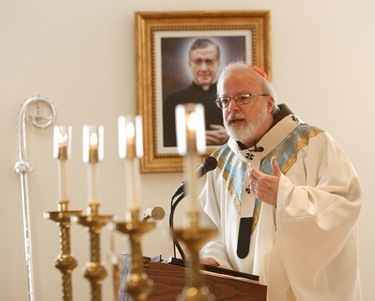 He would come to our parish every year because our pastor, Msgr. Charlie McBride, had been his assistant in the Propagation of the Faith, and they were very close friends. 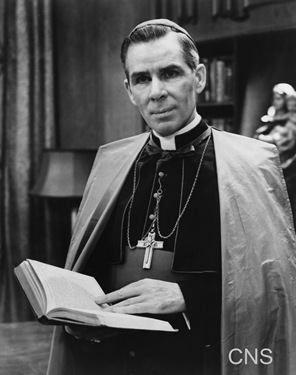 It was always an important event in the life of the parish when Bishop Sheen arrived. The other Masses would be completely empty and it would be standing room only at the Mass he celebrated during the week. There were three daily Masses but the people would all find out which Mass Bishop Sheen was going to say. Bishop Sheen would preach every day, which in those days was not done. 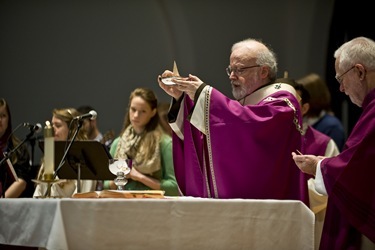 As many of you may remember, in the old liturgy, the priests used to preach only on Sundays. 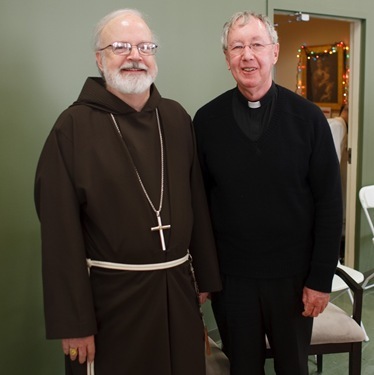 So, it was almost like having a mission in the parish every time that he would visit. He was just such an extraordinary individual, and the work that he did on behalf of the missions as well as evangelization in the United States was astonishing. 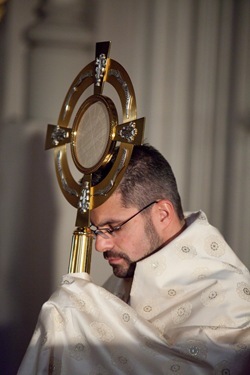 Thousands of people entered the Church through him. His television program did more to dispel anti-Catholicism than any other effort that the Church has ever been able to muster. 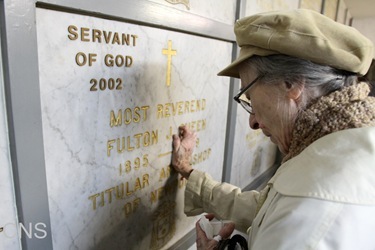 He is certainly a very, very important figure in the history of American Catholicism. He was a man who had such great love for the Church, for the priesthood, and for the missions. 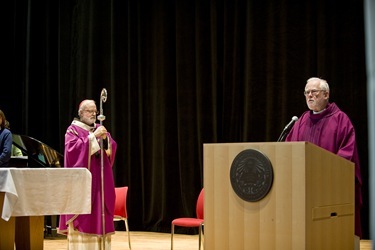 He was a man of extraordinary piety and it was my privilege to have had an opportunity to know him personally and now to help in his cause of canonization as a member of the Episcopal Board of Advisors of The Archbishop Fulton John Sheen Foundation, which is the official promoter of the Cause. In 1975, I invited him to speak to the priests in Washington at a seminar I organized on preaching social justice. The two speakers that I got for the seminar where then-Father Avery Dulles and Bishop Sheen. 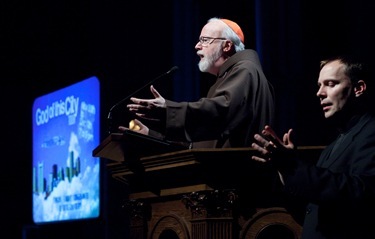 We must have had 500 priests come for it and we filled Harke Theater. Both of them gave extraordinary talks, but of course, Bishop Sheen has sort of a dramatic way of speaking. 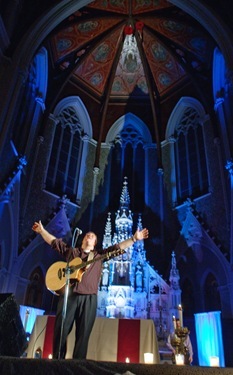 The priests must have given him something like a ten-minute standing ovation. That was the last time I saw him alive. He certainly was a bigger than life figure in the history of the Church in the United States!